#R755 Sleeveless bodice with side lacing and contrasting front panel. 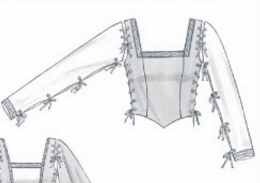 #R756 Bodice with side lacing, contrasting front panel, and bell sleeves. 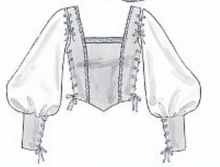 #R757 Bodice with side and sleeve lacing. 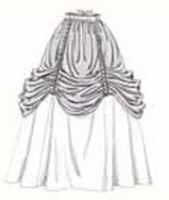 #R758 Long sleeved bodice with side lacing, cuff lacing and puffed sleeves. 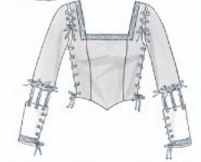 #R760 Corset with side lacing. 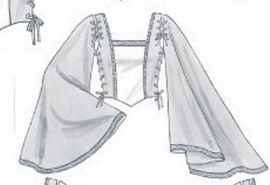 #R762 Corset with side lacing and skirted bottom. 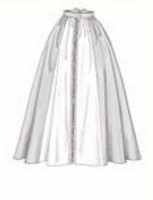 #R764 Plain skirt, floor length. 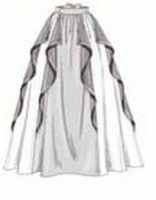 #R765 Skirt with scalloped contrasting overskirt. 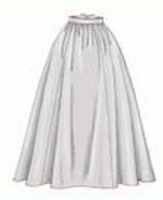 #R767 Skirt with ribboned apron overskirt in contrasting color.